Sketched April 14, 11:20 a.m.
Doug Beyerlein is crazy about outdoor stairways. He runs up and down them to train for grueling trail and long-distance races, and his 100th marathon is coming right up. His obsession doesn’t end with simply running the stairs. He counts them, too. In 2009, the 60-year-old civil engineer started what he believes is the first website to document every major stairway — those with 100 steps or more — in Seattle and beyond. Want to send your stairway running time? Beyerlein will log it for you in the “Stair Times” page. 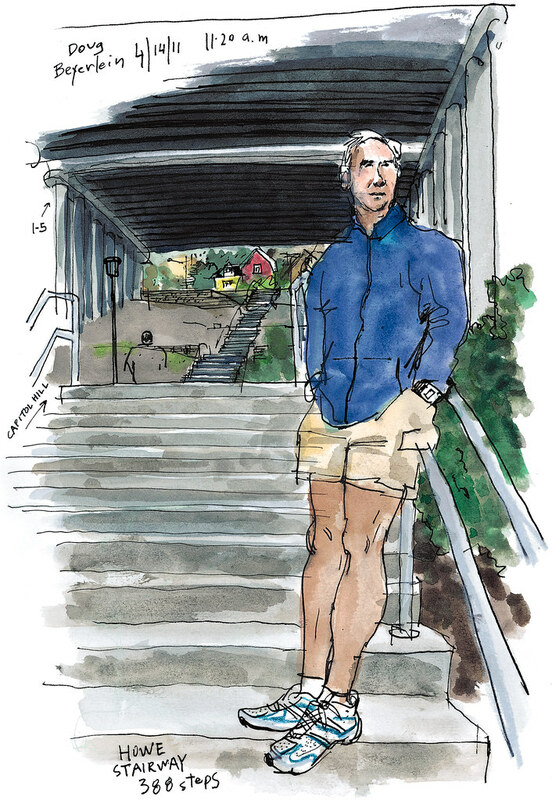 With 388 steps, the Howe Street stairway on Capitol Hill is the longest in the city and, according to Beyerlein, the third-longest in the country. Gil’s Stairs in Hood River, Ore., takes the top spot with 413 steps. Pittsburgh leads the city rankings with 117 major stairways. Los Angeles has 87, and Seattle and San Francisco tie with 79. Do you know someone with a story waiting to be drawn? Send me your suggestions via e-mail, Twitter or Facebook. Have a great weekend!